I am still thinking about the Chilli Beef Ramen I made on Friday night. I wanted to do something tasty and hot for Laura’s birthday so with Thai Fish Cakes to start then Chilli Beef Ramen, it was a real taste sensation – all Fussy Foodie friendly too. So I dusted off my Wagamama Cookbook from the bookshelf to try something new. I have never been to an actual Wagamama restaurant as my problem is most of the food includes sugar and wheat but with a few tweaks and some classic Fussy Foodie ingredients you can make some really tasty Wagamama meals at home. Blanch the beansprouts in a large pan of boiling water for 10 seconds. Drain, reserving the water, and refresh in cold running water. Cook the noodles in the reserved boiling water for 5-6 minutes or until just tender (depending on the noodle instructions). Drain thoroughly and refresh under cold running water. Heat a griddle or frying pan over a medium heat for 1-2 minutes until hot and almost smoking. Lightly rub the steak with oil, then cook for 2 minutes on each side until medium rare. Remove from the griddle, brush with teriyaki sauce and keep warm in some foil while it rests for 3-4 minutes. Slice on the diagonal. Divide the noodles between your bowls. Heat the stock, stir in the chilli ramen sauce and then ladle over the noodles. 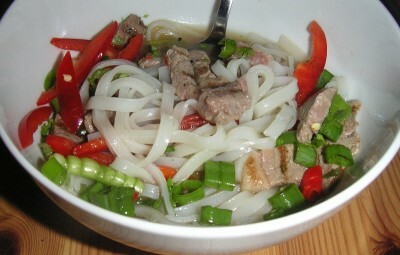 Top with the sliced beef, beansprouts, sliced pepper, spring onion, sliced chilies and coriander. Serve with a lime wedge for squeezing. I am loving noodles at the moment, they have a really fresh taste and once you have the basic ingredients in your cupboard you can make some tasty meals in minutes. Give this Chilli Beef Ramen recipe a try and you won’t be disappointed. Just make sure you have a spoon on hand so you can slurp down the tasty juices at the bottom of the bowl. Looks fantastic!!! i was in thailand last may its just like a real thai dish with no palm sugar and palm oil!!hahahah! It was amazing! Thank you Miranda for going to such efforts, it was a really special birthday meal.